Good morning! Another beautiful day here in RBNY land (but, then again, isn't everyday a beautiful day here in RBNY land?). 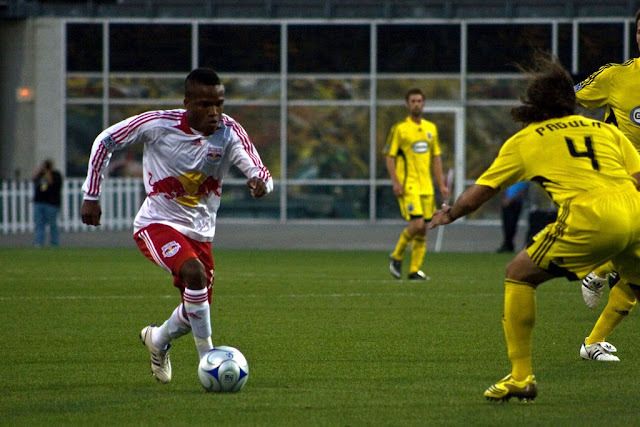 The Red Bulls are looking to get back to winning ways @The Cathedral of Football, Red Bull Arena (built by Makita) against the severely depleted Columbus Crew. It's a battle for Eastern Conference supremacy and unlucky Columbus will have to do without their midfield maestro Gillermo Barros-Schelotto (red card suspension). Columbus will also be without defender Chad Marshall and winger Robbie Rogers, both in Princeton with the USMNT. Also, their starting goalkeeper, William Hesmer, has some sort of back problem and might not play as well. If you had asked me earlier in the week, I would, have predicted a home loss, and Uncle Dietrich would now have his minions hunting me down with packs of German shepherds. Luckily, Guillermo Barros Schelotto got a little too aggressive with his elbows last weekend and is now suspended for the match tomorrow. Add that to Robbie Rogers and Chad Marshall being away on USMNT duty and that possible absence of Will Hesmer due to back trouble, and that leaves Columbus without its best midfielder, best winger, best defender and possibly its starting goalkeeper. Meanwhile we are without Austin da Luz, who I had almost forgotten played for us, Carl Robinson, whose role can easily be filled by Stammler or Tchani, and Salou Ibrahim, who has spent more time on his backside than on his feet since he arrived. Taking all of this into account, I am predicting a 2-1 Red Bull victory, with goals by Ream and Angel. Greatest American Hero look-alike Steven Lenhart will score for Cowtown. I'm not going to predict a Red Bulls win, but I'm not going to predict a loss either. This one, in my opinion, has nil-nil written all over. Columbus will be without their key offensive weapons, and our defense should do a good job containing Gaven and Lenhart. Also, the lack of midfield creativity on the part of the Red Bulls will continue. Our fowards will not get many chances until a true creative midfielder is brought in and I'm predicting the goal-drought will continue today. That said, I hope I'm totally wrong and that this game turns out to be a Red Bulls Goleada. Columbus are down their three biggest talents in Schelotto, Rogers, and Marshall. The Red Bulls entire starting midfield is injured except Dane Richards, and he's reportedly going to start partnered with Angel up top, so none of our regular midfield will be playing midfield. To me, this game has boring 0-0 draw written all over it. However! Our Leader, Coach Backe, has our reserves (the Backe-Ups!) trained and fit! From our two US Open Cup matches, it would seem that they might understand the system he is teaching better than some of our regular starting XI. Columbus may be more out of synch with so many key players missing, more so than our Red Bulls. So I am choosing to ignore my gut instinct--defeat is not an option!--and say that the Red Bulls will somehow hit the back of the net in an otherwise uninspiring game, and come away with a victory. Red Bulls win, 1-0. Chinn or Woly late with one of their trademark strange goals. Well these are desperate times. A two game, -5 goal differential skid. 8 players out due to various injuries. JPA looks like he's been playing wearing an artificial leg. An utterly uncreative midfield will be missing its two best players in Lindpere and Nielsen. It's all going wrong. This is going to be a makeshift lineup. I don't know where our goals are coming from. Of course Columbus is missing its three best, including Schelotto. So I guess this will be a battle of who is deeper. This is going to have the feel of an Open Cup match with so many reserves being used. But I believe that Mr. Backe's Army is up to the task of defending RBA against the Columbus hordes. Final score RBNY 2 Columbus 0. Red Bulls season ticket holders can pick up free ticket to next Wednesday's US Open Cup match against Colorado after today's game. If the great Mike Petke, a MetroBull Legend, plays today (and there's no reason why he shouldn't) he'll reach the unbelievable milestone of having played in 300 MLS games. Congratulations in advance dude!